Significant evidence now exists that ancient cultures worldwide were all connected by a powerful religious symbol which I call the “GodSelf Icon,” that is especially conspicuous among the pyramid cultures. In my 2011 book, Written in Stone , I revealed how these pyramid cultures all employed the same three-door “Triptych Temple” pattern. Another discovery that I announced concerns the GodSelf Icon, an image depicting a central figure, a hero or god, facing forward and holding in either hand parallel objects or animals. Just as the crucifix symbol unites millions of Christians under one universal religion, so the GodSelf Icon symbol did the same for our ancient ancestors. The ancients shared a common wisdom and possibly a common heritage. Central door flanked by two smaller doors seen in architecture around the world. The center door is the “source”—the “soul” inside the body. The twin doors are the opposing bodily forces of duality that surround the soul on either side, and that the soul must confront and master in life. Triptych façade, Rockefeller Center, NYC. As with the Triptych, the GodSelf Icon represents the soul of the hero or sage who balances his opposing bodily forces, represented by the twin objects held symmetrically in each hand. The GodSelf Icon calls upon us to develop our inner strength and spiritual potential by means of balancing the twin opposing forces within us (through meditation) and by carefully cultivating our physical and mental powers. The concept of an external “God,” as in the familiar monotheistic and polytheistic religions, is a distraction from what I believe is the true purpose of religion, which is to recognize the eternal nature of our own spiritual being and to nurture the “GodSelf” within ourselves. The GodSelf Icon inspired the logos of companies like Starbucks. The origins of the GodSelf Icon can be traced to a Golden Age “Mother Culture” that may have existed in the prehistoric past. Some Victorian-era scholars associated the Golden Age with Plato’s Atlantis, and with ideas of the rise and fall of civilization over a period corresponding with the Zodiacal precession of the equinoxes which takes roughly 25,000 years. Plato called it the “Great Year”; the ancient Greeks, even before Plato, linked the Great Year with the seasons. Similar theories lay behind such phenomena as the Mayan and Aztec calendars, and the Hindu Yuga concept. The most ancient stone structures are the most advanced. In Italy, for example, Etruscan aqueducts and monuments are more tightly put together than later Roman-era constructions. The Great Pyramid at Cheops is thousands of years older than the inferior pyramids that surround it. The aqueduct in Segovia, Spain (said to be Roman) is far more advanced than later aqueducts. The development of many technologies in the ancient world often seems to reflect more degeneration and decay than progress. Perhaps this is really a result of a genuine pattern of a Great Year cycle of the decline and fall of civilizations, where the great period of spiritual achievement occurred over ten thousand years ago, and has been followed by a period of ever-accelerating spiritual decline. The purpose of my new book is to help uncover the real truth of the human past, in order to understand and eventually to reverse this decline. The Rebis is an ancestor of Masonic tracing boards that feature similar dualities; like the tracing boards, the message of the Rebis is to overcome dualities by means of mystic techniques involving the ancient practice of balancing opposites to find the center. 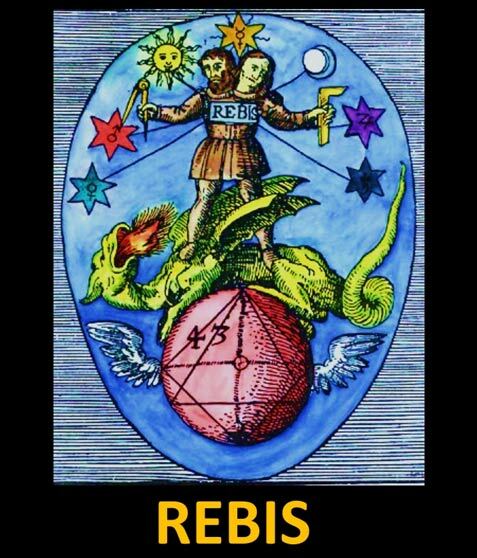 Note the Masonic Square and Compass symbols in the left and right hands of the Rebis—simple tools used to build incredibly advanced stone monuments (pyramids, aqueducts, cathedrals) which to this day remain a testament not to the “technological” power of the ancients, but to their “spiritual” centeredness. Most Freemasons have no idea what their symbols mean. My research has convinced me that the “lost secret of Freemasonry” is the same as the “lost secret of the Incas” and the same as the “lost secret of the Egyptians.” The GodSelf icon, which is identical in form and meaning in places as far apart as Egypt and Peru, is an important key for understanding the origins and destiny of mankind. Richard Cassaro ´s new book, The Missing Link , is available on Amazon.com and on his website www.RichardCassaro.com. Images, unless otherwise noted, via author Richard Cassaro. Richard Cassaro's new book, The Missing Link, explores the meaning, transformations and propagation of the ancient world's most important religious icon. The triptych signifies the triple helix in all cultures, with our double helix missing just one thing, denoted by the usual god in the center. That central figure represents the DNA of the gods who made us; the Annunaki, and subsequently, our inevitable mortality without it. The ancients were much smarter and much more gifted than many realize. It is true that the oldest masonry is often the most advanced. In some places, the masonry is so inexplicable, it is impossible to explain it by any means other than advanced technology. The Ba'albek platform and its twin on Mt. Moirah. The dark granite boxes in the Serapeum, each carved from a single immense stone with precision tolerances measured in ten-thousandths of an inch. The seemingly whimsical sites scattered throughout the Andes in Peru that do not appear to have ever been part of a structure and display astonishing capability in shaping stone, entire cliff faces cut into smooth, flat surfaces, complex arrays of gear-cog teeth, a small group of stone cubes formed so finely the corners are sharp enough to cut, and many other features equally difficult to achieve. The keystone cuts imply some kind of portable smelting. The Imperial grounds scattered about in Japan contain some of the largest single stone blocks in the world, and the high, convex curved platforms have survived thousands of years of earthquakes needing no repair and looking as though they were completed yesterday. Huge granite outcrops in Bolivia that have been shaped into complex geometric forms that convey a clear sense of utility and purpose, though what that purpose might have been, no one knows. The huge statues of Rameses II in Egypt with perfect bilateral symmetry, impossible to achieve by hand and eye alone. How would spiritual advancement, a focus on the inner self and the immaterial, help achieve these things? Seems to me that tools are required. Tools as advanced or more so than what we have today, or based on principles of physics which are unknown to us. It should be 'Man, Woman and the Sacred Divine - or Fertility, represented as the Unborn Child. Who is El in Egyptian mythology? I know it is the Hebrew name for the Sumerian 'Enlil', but that has nothing to do with the Egyptian pantheon of deities.